With the rate of unemployment rising every year in Indonesia, that eventually will create more social & economical issues, now we have to focus on starting our own company and absorbing more human resources. The famous Indonesian Donald Trump, Ciputra, said right now Indonesia only has 400,000 entrepreneurs out of 250 million population. That’s less than 1% of the population. Compare that with 7% for nearby Singapore. Ciputra plan to encourage, create and mentor 4 million entrepreneurs or 2% of the country’s population by changing the country’s mindset. One of ways to change a mindset is by thinking outside the box, and in our case is: thinking outside the country. Then, off we go to Dublin, Ireland. My partners Natali Ardianto, Nuniek Tirta, Sanny Gaddafi and I, have been creating routine monthly event called #StartupLokal Meetup, to gather startup business owners, investors, media and enthusiasts. The enthusiasm of #StartupLokal community has been amazing, more new audiences attending the event, more new startups launched and more investors coming. Now we’re ready to design concept to help build the best environment for Indonesian startups. As our government still focusing on something else, Irish government through Enterprise Ireland showed their interest in showing #StartupLokal how they build system to help their local startups grow, by creating one special division for startup called High Potential Start Ups (HPSU) division in Enterprise Ireland and creating business incubation on campus. Ireland obviously have a better approach to encouraging small business. Taxes are lower. Ireland’s corporate rate is less than one-third the combined state and federal rate in the US. Companies like Facebook, Google, LinkedIn and rumoured has it, Twitter, are opening their office in Ireland, creating a reputation for Ireland as The Silicon Valley of Europe. They also have lower regulatory barriers for entrepreneur, greater access to capital & mentorship, and more positive beliefs in the value of small business. That’s why we’re so excited when Enterprise Ireland, via Patrick O’ Riordan, invite us to visit Dublin to learn more about how they’ve been nurturing the startups & build condusive environment for 20 years. I’ve been curious with the guidelines of managing startups, because our vision for #StartupLokal community is not only for making meetups, but eventually create better ecosystem for startups, just like what Enterprise Ireland did. And we’re so ready to absorbs the knowledge. The meeting with Kevin Sherry, Manager International Sales & Partnering of Enterprise Ireland, also with John Convery from HPSU division really open my eyes and inspired me. A lot of useful knowledge that we can use & implement to grow the community. We’re cooking something now! This is John Convery’s presentation that you might check to inspire you to adapt and doing your own piece of social responsibility. After meeting Enterprise Ireland officials, we’re also scheduled to meet some Irish Local Startups. We met Dublin Web Summit founders, the equivalent of #StartupLokal in Ireland, where we found so many similarity in their story with our own. We also met Miriam Magner CEO & founder of Career Decisions, Darren Bowler Product Marketing Manager of Movidius, Brian Kiefel Managing Director of Retail Media System, and Arthur Cagney Director Market Development of Newbay Software. In Indonesia, mobile market is BIG. Irish don’t use mobile phone to connect with the internet or social media as intense as we do. They don’t have traffic jam (even though they claimed to have one, oh boy, believe me guys, it’s barely a traffic jam). They can just connect at home or at the office and that usually not for socializing, but for working. We’re early adaptors, we’d love to try everything’s new from gadgets to new social media websites. One thing I note is about B2B. All of the startups that been introduced to us are mainly doing B2B. I realized now that they way we do B2B is slightly different, or in my case, it’s different. We have 250 million of population. In 2008 our internet users was 7,9% of the population. If we estimated that internet user in Indonesia are around 25 million people, that’s already 6x Irish population. And what I’ve been doing (with my startups Kutukutubuku.com & NulisBuku.com) was aiming for B2B but thru B2C. While we gain reputation on consumer market, individual references will go up to the corporate level. And that’s, in my opinion, effective in Indonesia. Every now and then in the meeting, I will nudge Sanny and exchange glances with Natali, because I’m amazed on how Irish Government through Enterprise Ireland been really really helpful to help the growth of their startups. Patrick has been in the meeting the whole time, guiding our discussion and taking note on how he could help connecting their startups with Indonesian partners and help creating access to market. That, I can only dream, happening in Indonesia. 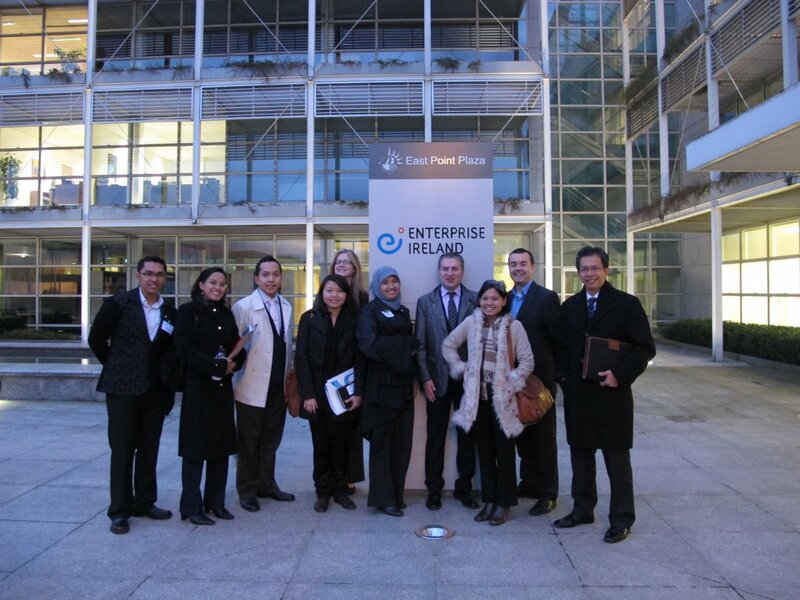 Day two of our business trip in Ireland was filled with tour to several business incubation on campus. Indonesia universities mindset are still the same old mission to train students to be employees. And that’s too bad because we now want to create more jobs, thus students should be introduced of ways and supported to be entrepreneur from the very early stage of their study. Enterprise Ireland support campus to build business incubation of their own, where not only students, but also other people, encouraged to use the campus facilities to do research and development and build their own startup. We were only visiting Synergy Center at Institute of Technology Tallaght (ITT) Dublin, NovaUCD (Innovation & Technology Transfer Center) at University College Dublin and The Digital Hub, but from what I’ve heard, all campus in Dublin already have incubation facilities (!) This is the point where I nudge Sanny one more time. My first mindset about an incubation is always about a place where new startups could work and build their empire from scratch. That’s all. After visiting all the incubation, I finally learned that an incubation needs a lot more than that. The incubation should assist innovators and entrepreneurs to take their ideas from proof of principle to full commercial success, one of the way is by giving access to mentorship. I found out that Enterprise Ireland has its own National Mentor Panel where there are group of experts are ready to mentor when needed. We should have that kind of mentor panel too! Research and Development (R & D) is one of the most important part in doing business that, unlike us, they all handle very seriously. A solid idea could be funded with serious amount of fund to do R & D in the incubation facility. And you could get more fund once you manage to build the business plan out of your idea. Awesome. One small but important detail that all the incubations have is a place where people could sit and hang out, could form as a cafe, or bench all over the facility. Because they believe that great ideas, often come from human interaction & connection on a casual conversation over a coffee, or just a minute or two idle time sitting in the hallway. Amazing way of thinking! All 3 incubation that we visit offer slightly different method for startups to use their facilities. Synergy Center doing routine workshop and seminar for networking, NovaUCD create special program every year for startups to pitch and get a chance to use their facility for 9 months to incubate their ideas, and Digital Hub, located in the heart of Dublin just in front of Guinness Storehouse, focused on digital content & technology enterprises. We have learned all complete details on how they manage their incubation and that will be very useful to apply it in Indonesia. I’m so excited! Ireland have many great poet and authors inspired by the beautiful country, such as the legendary Oscar Wilde (I went to his house in Dublin! ), William Butler Yeats (where the National Library of Ireland making a special tribute to Yeats), and of course the popular young writer Cecilia Ahern of PS: I Love You. Pat has been kindly arranged a meeting over dinner for me and Claire Kilroy, beautiful Irish writer that has published 3 novels. I bought one of her novels, TenderWire, and I love love how she write description and details in simple but yet sophisticated words that makes readers feel related and connected to the story. I went to 2 different libraries in Ireland, the classic and oldest one in Trinity College Dublin where they keep Book of Kells for 300 years now. The Long Room has amazed me with the amazing amount of collection and how it stored systematically (mind you, it’s a library aged hundreds of years). And the National Library of Ireland. What more should I say. They’re not offering just books, but enjoying the beauty of writing, to be totally and fully experience the book. I remember our own national library and cringed. I have a lot of plans in my mind about how to adopt what I’ve seen in Ireland to Indonesia. And I’m burning right now! Thank you very much Enterprise Ireland for inviting us, hope to have a long term partnership and we could continue support each other. #StartupLokal 1st Anniversary – a Personal Note | Ollie's Blog :: Read. Write. Blog.